Around the time of Mexican independence from Spain in 1821, soldiers of the Presidio of San Diego began building their homes outside the adobe walls of this fortified settlement. One the finest example of these homes is the Estudillo House, a National Historic Landmark located in the Old Town San Diego State Historic Park. Built between 1827 and 1829, the Estudillo House, or the La Casa de Estudillo, is one of the oldest surviving examples of a typical large Spanish-Mexican one-story town house in California. Since its construction, the house has served as a residence, a town hall, a chapel, a shelter, an early 20th-century tourist attraction, and a museum. Construction of the house began in 1827 on a land parcel that overlooked the Old Town San Diego plaza and under the direction of Captain José María de Estudillo, a commander of the San Diego Presidio. The great U-shaped one story house is built around three sides of a large patio and originally contained 13 rooms set in a straight line. The rooms are connected only by an external veranda. The adobe walls, averaging three to five feet in thickness, are coated with white plaster and gave protection in heat and cold. Originally a small round wooden cupola, used by the family and guests to watch the bullfights and festivals in the plaza, topped the house. 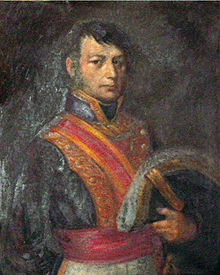 When José María de Estudillo died in 1830, the house passed to his son, José Antonio Estudillo and his son’s wife, María Victoria Dominguez de Estudillo. The house was to become the social center of life in Old Town San Diego. The building was so central to town life that, from the early 1830s to 1856, a large hall in the house served as the town chapel and as a school. 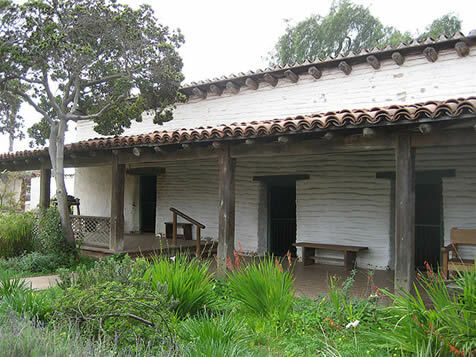 José Antonio and María Victoria fostered within the Estudillo House an atmosphere of social, political, and community involvement in what was considered at the time to be one of the finest houses in Mexican California. Both José Antonio and his wife María Victoria were active and influential members in their community. By 1829, José Antonio owned three ranches in California, and as his wealth grew, so did his importance in the community. From 1828 until his death in 1852, José Antonio held many public offices in San Diego. He served as revenue collector, treasurer, mayor, justice of the peace, judge of San Diego under Mexican rule, and later as treasurer and assessor of San Diego County under American rule. While José Antonio played an active role in the development of early San Diego, his wife fully participated in the life of the Mexican pueblo and the new American city. María Victoria lived in the Estudillo House for over 40 years until her death in 1873. Known for her charm, compassion, and hospitality, María Victoria and José Antonio entertained some of the most brilliant and aristocratic citizens of Upper California in the Estudillo House. During the Mexican-American War, instead of joining her husband at one of their homes in El Cajon, María Victoria remained in San Diego. While the “Californians” held the area, María Victoria gave courage and spirit to the women and children of San Diego providing them with refuge behind the thick walls of the house. In the early 1850’s, when peace had returned to California after the war, unexpected deaths in the Estudillo family left nine children orphaned. María Victoria immediately welcomed these children into her home, and she bore the responsibility of raising this new family alone for José Antonio passed away shortly after in 1852. For the next 21 years, María Victoria continued to live in the Estudillo House, raising her new family, taking care of the sick, and performing acts of charity where she could. The Estudillo House remained in the Estudillo family until 1887, when family descendants moved to Los Angeles and left the home with a caretaker. Around this time the house gained prominence through its association with Helen Hunt Jackson's popular 1884 novel Ramona. Set in Southern California, the novel painted a romanticized portrait of Mexican colonial life, and it effectively generated a nationwide interest in the region. Publication of Ramona coincided with the opening of railroad lines to the region. This provided interested tourists with the means of transportation to see the locations discussed in the novel. While the novel was a work of fiction, tourists flocked to the Estudillo House nonetheless, because they believed it was likely the location of Ramona’s (the beautiful half-Spanish and half-Indian heroine) marriage. 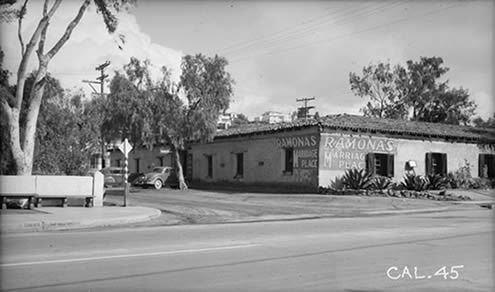 The Estudillo House became known as “Ramona’s Marriage Place” and was converted into a commercial venture. Casa de Estudillo, marketed as "Ramona's Marriage Place"
Due in part to tourist vandalism and the caretaker selling off pieces of the house as Ramona-related relics, the house sat nearly in ruins by 1906. Nat R. Titus purchased the worn-down house and sold it a year later to the San Diego Electric Railway Company, owned by sugar magnate John D. Spreckles. In 1910, Spreckles financed its restoration under the supervision of Architect Hazel Waterman. Restored to a condition closely related to descriptions in the novel, the Estudillo House remained a Ramona-related tourist attraction for many years to come. On one day in 1940, “Ramona’s Marriage Place drew 1,632 visitors. Donated to the State by Mr. Legler Benbough in 1968, the house became part of the California State Park System. Restored as a house museum identified with the Estudillo family, the museum now features furnished rooms, including a living room, master bedroom, child’s bedroom, workroom, dining room, chapel, a working kitchen, and a large courtyard. Through self-guided or docent lead tours of the Estudillo House and the many other historic sites throughout the Old Town San Diego Historic Park, visitors can experience the transformation of San Diego from a Mexican pueblo to an American settlement. Estudillo House (La Casa de Estudillo), a National Historic Landmark, is located at 4000 Mason St., San Diego, CA. Click here for the National Historic Landmark file: text and photos. The Estudillo House is open daily from 10:00am to at least 4:00pm, April through March, and 10:00am to 5:00pm, April through September, except on Thanksgiving, Christmas, and New Year’s Day. Admission is free. For more information, visit the California Department of Parks and Recreation: Old Town San Diego State Historic Park website or call 619-220-5422. Estudillo House has been documented by the National Park Service’s Historic American Buildings Survey.